It was 15 years ago, during the first annual Crown of Maine Balloon Festival, that hot-air balloon pilots Jim Rogers and Doug Shippee of Saint John, New Brunswick, and Joel Jones of Seale, Alabama, launched into the air from Dolores and Bruce Roope’s backyard. PRESQUE ISLE, Maine — It was 15 years ago, during the first annual Crown of Maine Balloon Festival, that hot-air balloon pilots Jim Rogers and Doug Shippee of Saint John, New Brunswick, and Joel Jones of Seale, Alabama, launched into the air from Dolores and Bruce Roope’s backyard. Since then the Roopes’ property on 169 Reach Road in Presque Isle has not only become a go-to launching and landing destination for over a dozen balloon pilots during the festival, but also a place where deep friendships and many unique memories have been made. “Whenever they come back it’s just like seeing family members that you haven’t visited in awhile,” Dolores Roope said. On Friday afternoon, Aug. 17, she and her granddaughter Sam were busy making asteroid-themed, pink-and-blue-frosted cookies for all 15 pilots who are slated to visit with the Roopes for dinner, desserts, laughter and good times during this year’s festival, Aug. 23-26. 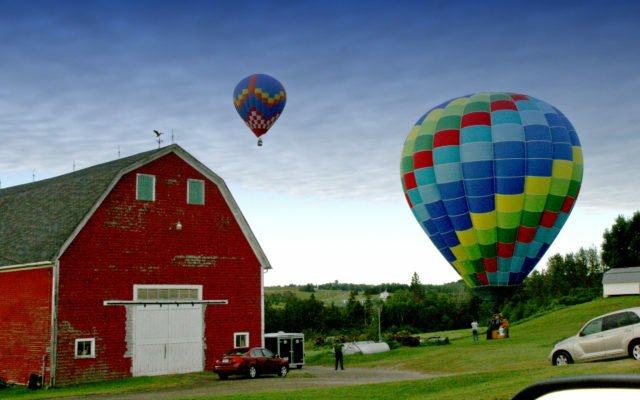 Preparing balloons for flight and properly storing them afterward is labor intensive, so pilots typically search for open fields to land, and the vast landscape of Aroostook County lends itself well to such endeavors, according to Bruce Roope. He and Dolores are among many residents who for years have given pilots permission to land on their property. As crew members they have learned exactly what weather and land conditions pilots need for a beautiful and safe flight. The unpredictability of flying makes Dolores and Bruce’s jobs as crew members even more fun while they chase Purvis’s balloon with their car for an hour or more and keep in touch with him through two-way radio. They always hope to arrive at his predicted destination before he does so they can assist passengers and begin disassembling the balloon. But sometimes there’s a challenge in keeping up with a balloon that’s floating in the sky above them and moving at a much slower speed than their car, as the couple learned one year while following pilot Grant Aiello of Orlando, Florida, who will not be part of this year’s balloon festival. 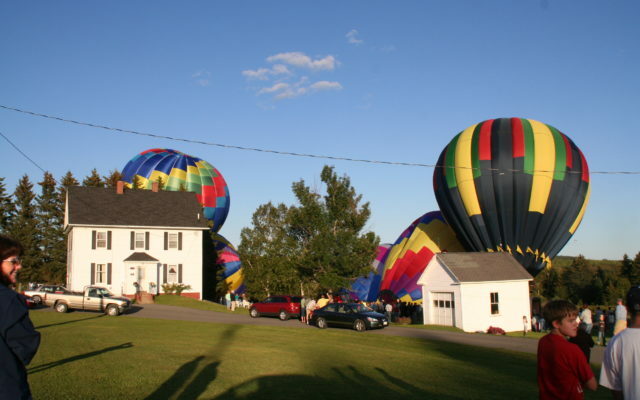 The Roopes have become so well-known among pilots and festival volunteers that everyone calls Dolores, who is Purvis’s balloon captain, “Balloon Central,” and their home is where many pilots stay during their visit to Presque Isle. Purvis has flown in the Crown of Maine Balloon Festival for all 15 years, and over the years Dolores and Bruce have become like a second set of parents for him. Purvis has been flying balloons for 30 years and has been part of festivals everywhere from New Hampshire, Vermont, New Jersey and Connecticut to Tennessee, Virginia, Alabama, Ohio and eastern Canada. This year he will travel to Presque Isle from a festival in the Lewiston/Auburn area of Maine and then head to festivals in Bath and Sussex, New Brunswick. Every year Purvis stays with the Roopes from late July through September in between his travels to various festivals. He said that, aside from Dolores’s cooking, what keeps him coming back to Presque Isle is the Aroostook County scenery that gives beautiful views for flying. Several years ago the Roopes visited Purvis and his family in Florida, traveling to Panama City and helping Purvis during balloon flights. Despite the physical distance that separates the friends throughout most of the year they stay in touch and look forward to the days when “Tracer” graces the clear blue August skies near their home again. Purvis will even arrive days before the event so that he and the Roopes can offer flights to folks who cannot attend the festival. This year the Crown of Maine Balloon Festival will be held from Thursday, Aug. 23, to Sunday, Aug. 26, and if the wind blows just right “Tracer” and many other balloons might lead dozens of community members to the Roopes’ home to get a glimpse of the large balloons landing on their property. Crowds of people gather at the farm of Dolores and Bruce Roope at 169 Reach Road in Presque Isle in 2006 to watch balloons launch during the annual Crown of Maine Balloon Festival. The Roopes have been involved as balloon crew members since the festival’s inception fifteen years ago and have formed lasting friendships with this year’s returning pilots.